GB writes: "God of War has been undoubtedly Playstation's premier franchise. With God of War I and God of War II both selling a combine five million units, Sony had to pull out a sequel for the PlayStation. God of War III is the final chapter in the trilogy and it will finally explain why there are no more Greek Mythologies. We have seen this game at E3, TGS, SDCC and other events this year. To be honest with you guys that the game is coming off really well, but there are certain shortcomings as well. We take a look at the bad and the good about the game so far." Boss battles have always been a highlight of the GOW games. I hope that there will be some epic battles. yep! really looking forward to them. I wonder how many battles will it have. GOD OF WAR 3 ILL BE THE BEST GAME EVER MADE ROFL!!! Thanks for the heads up ChrisNick, I could have sworn I saw the GOW collection up there lol. Well, now that I know what the article is about. Its hard to say if GOW3 will be a fail or success. Many PS3 fanboys say nothing on 360 has surpassed Uncharted 1, yet sales have shown that MOST people don't believe that. As far as quality, I don't thk it'll fail. im pretty sure the article is referring to god of war 3 which im pretty sure even you will be picking up...prepare for the disagree barrage you're going to recieve.
. . . it's effing God of War. "1 reason it wont fail . . .
. . . it's effing God of War." This article is a joke. It recycles the gameplay? Seriously? The author is a moron. The mechanics were great for the first two and there were refinements in the second game. It's like b1tching that shooters have the same gameplay: see dudes, shoot dudes. All we know is that gow3 will have more than four bosses and less than (what ever the number of bosses in gow2 was, which is at least higher than 10), calling that a bad thing is stupid. Anyone who really thinks this game is gonna fail has probably never played the first 2. GOW is in the top 5 best gaming franchises ever created. And thats a fact. GoW 1 and 2 are worth every penny. They're simply some of the best games ever made. The combat is a blast, the story is sick, and the presentation is second to none. Next spring can't arrive fast enough. I love my XBox 360 but I love my PS2 more. God of War is a great franchise not because of the visceral combat or great graphics but the way the story is so intricately wrapped around myth and wonderfully told. I can't wait to see what happens next in what is an epic story. Being the same button masher is not a bad thing, they can't change it, its a good thing, without it = not god of war. they added some new moves and weapons thats good enough. Or Burnout the same old racer. I guess so. And its not like its boring button mashing either; its pretty fun (and bloody!). I am actually a bit skeptical on that since i dont see any new innovations in the gameplay! innovation? this game defines hack and slash, no other game does it better than GOW imo, no other game uses chains, no other game is based on some mortal who all he wants to do is rip the heads of gods. God of War 3 can't fail. Seriously. What's most likely going to fail next year? Alan Wake. Remedy is making Alan Wake, the creators of the award winning masterpiece Max Payne 2 The Fall of Max Payne!!!! Luigi's Mansion is in my top 10 favorite Gamecube games. GOW3 Can fail, especially when the first 2 Games where Masterpieces. lol a Necrum.. that was a Random comment. Not difficult to see a button masher fail. What's not to like? You get to rip peoples heads off! well if you have played the first one than i suggest that u try the third one! I'm not a fan either, I've never gotten into button mashers. I can however say fairly that it is a good series but it's just not to my taste. @baldguy- U have a point. God of War 1 and 2 didn't sell very much even though they were advertised like crazy. I thk God of War 2 was great, but I can understand how people don't like it. bloody epic button smashing games are not for everybody. Same goes for guitar games. This won't fail. It just may have the impact of the game lessened because of Dante's Inferno doing pretty much the same. Although, realistically coming down to it, Dantes Inferno is the one in trouble if it can't stand up to the might of Kratos' finale. Yes, you read that right, judging from the previous experience of GoW series and the footage I've seen of Dantes Inferno, I wish both the best. Because last time I still feel I was right, Infamous and Prototype were equals despite being very similar. Dantes inferno will no way compare with gow3! I dunno. It's looking like really good filler like Haven was filler between Jak and Jak 2. God of War III can't fail! but what if it did! To bad God of War III is the last of the series.. EVER!! "To bad God of War III is the last of the series.. EVER!!" GOD OF WAR 3 .. I remember an interview about a sequel, I forgot which game it was. But it was something like a double edged sword. On one hand, if you make the game too much like the first one, then people will think it's not different enough to be a sequel. On the other hand, if you stray too far from the formula, then the game might suffer. So honestly, even if GoWIII plays like the other GoWs, it's not a bad thing. However, I think people do expect the leap from the PS2 to the PS3 to be rather significant in both graphics and gameplay. But everything is speculation until we all get our hands on the game. Either way, I'm buying this game day one. God of War never fail! And Kratos never die! Actually I think Kratos WILL die in this last epic installment. 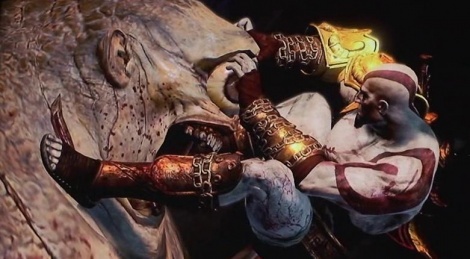 Wholeheartedly, he deserves to die, either by what he's done or just finally being laid to rest after having been manipulated by the Gods for so long, his rage is the only thing keeping him going, as seen from GoW1 and CoO, he really wants to join his family in peace again but cannot forgive himself in self angst. I for one, would not be happy if Kratos didn't die at the end of GoWIII, that would be a cop out. No it's not developers have already confirmed that buddy nice try. I don't see this game failing, they are way too awesome. It's the last one with Kratos the series will still go on. This game isn't going to fail. Only way it seeing it failing is from a sales standpoint. God of War 2 in 2007 well into the next gen and sold a nice 2million or something of that sort. The Ps3 gaming trend I don't see it getting past its predecessor. But as a game it should rock. But my money is on Castlevania. Price cut, increased advertising, killer exclusives...Sony is on the upswing and we are balls deep in a recession. GoW 3 will sell a lot as will Uncharted 2. Toss in Ratchet and Clank and GT and, well, it's gonna be a very merry xmas for PS3 owners. but Kratos will live on in other games. about the bosses. i can't say on how many there will be, but i know at least one sounds innovative. Hades. As you attack him, his skin will fall off and attempt to crawl back to hades' body or something like that. And about David Jaffe, he left a huuuuuuge list of things for god of war 3, and he still stops by and offers advice and stuff, so it's not like he just up and disappeared. I found that point in the article pretty funny. Jaffe hasn't touched the GoW series since 2005. Each game has been headed by a different lead developer, hasn't done the series any harm at all. Yes the writer of the article did not do their homework when researching the series. The only credit Jaffe got on GOWII was a thanks. I just hope the game is around the 15 hour mark. TW i loved the gameplay for the first 2 games, if it isn't broken then don't fix it like some have said. Im sure there are plenty of new stuff to do in this game. It's God of War. How could you have any doubt? there need to be more boss battles. That was the only thing that I felt was lacking from previous two games. Well, since this is the last game, we can expect all sorts of monstrosities coming out of the pit to battle Kratos: his brother being one of them I hope. Yeah and for good reason. From what I rcall all they upped on from GoW was adding aerial combos.You dont hear people saying the same thing about DMC or Bayonetta do you? "The original two had some phenomenal boss battles. The only weak point is that there were about two in the first game and as far I can remember" Speaks for itself. Heres what I can recall from memory for GoWII. The Statue,Barbarian King,Kraken,Sisters Of Fate. And I'm positive theirs many more. Jaffe didnt touch the second one at al. Corey Balrog did a fine job. As for the Positives. Everything else is a given as to why it will be good. If you miss out on any god of war games, you are miss out playing one of the best game in HISTORY.